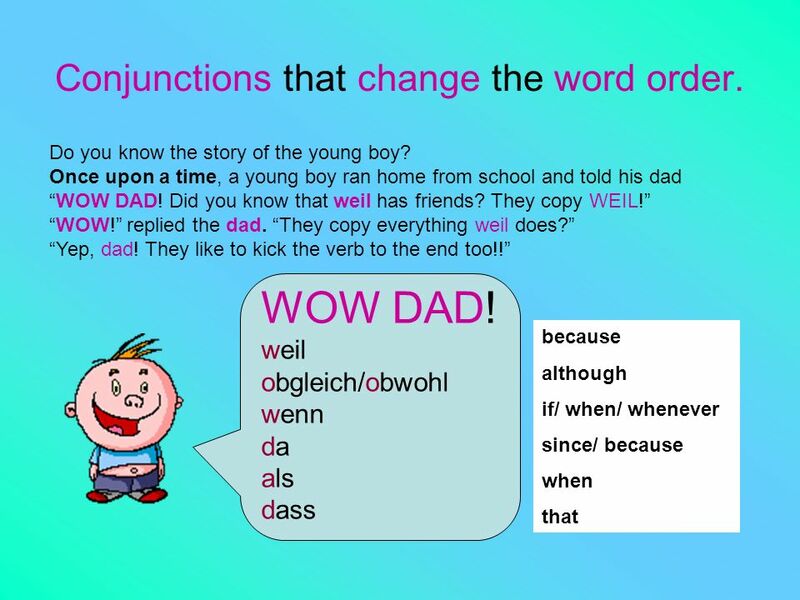 Conjunctions that change the word order. 1 Conjunctions that change the word order. 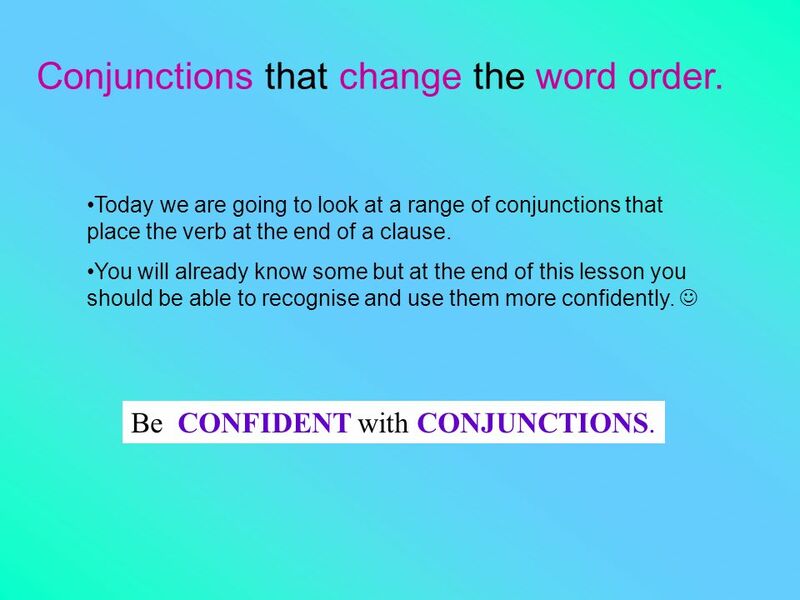 Today we are going to look at a range of conjunctions that place the verb at the end of a clause. You will already know some but at the end of this lesson you should be able to recognise and use them more confidently. 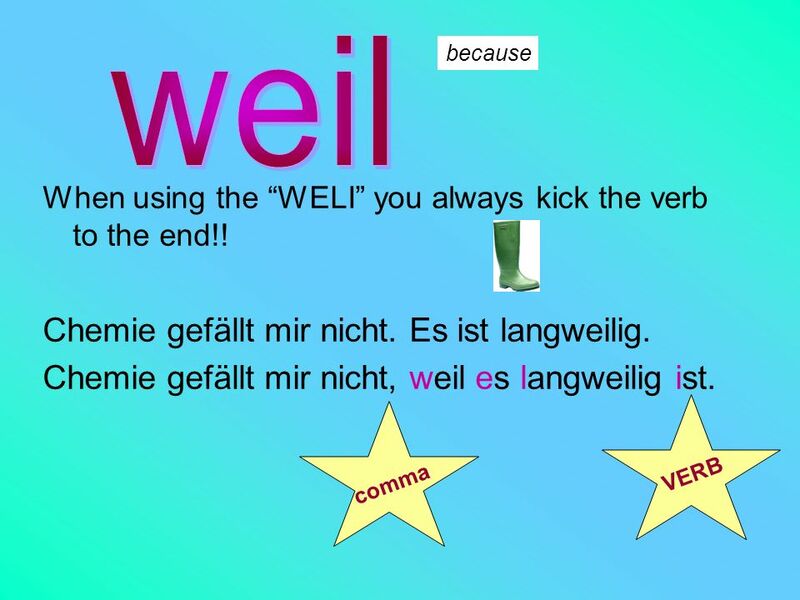  Be CONFIDENT with CONJUNCTIONS. I like to kick verbs to the end of a sentence. Here’s an example: Ich mag nicht Mathe, weil es langweilig ist. 3 weil Chemie gefällt mir nicht. 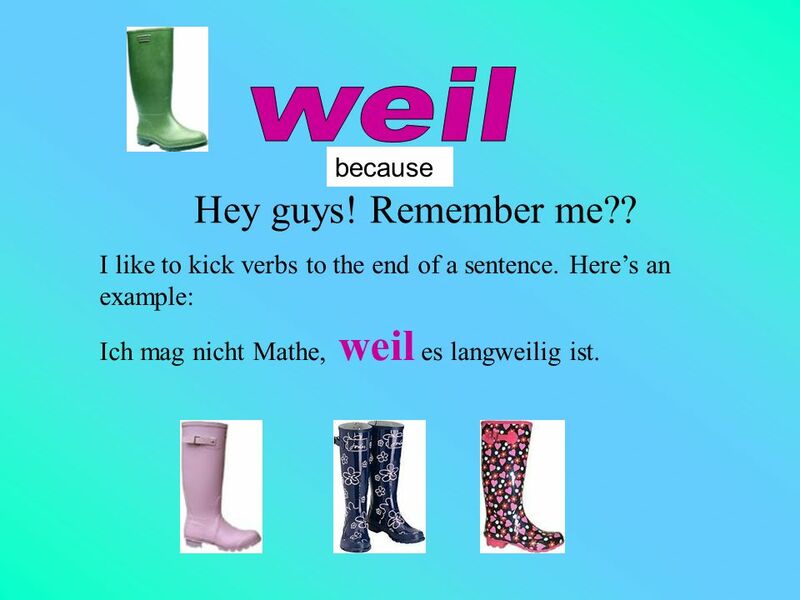 Es ist langweilig. 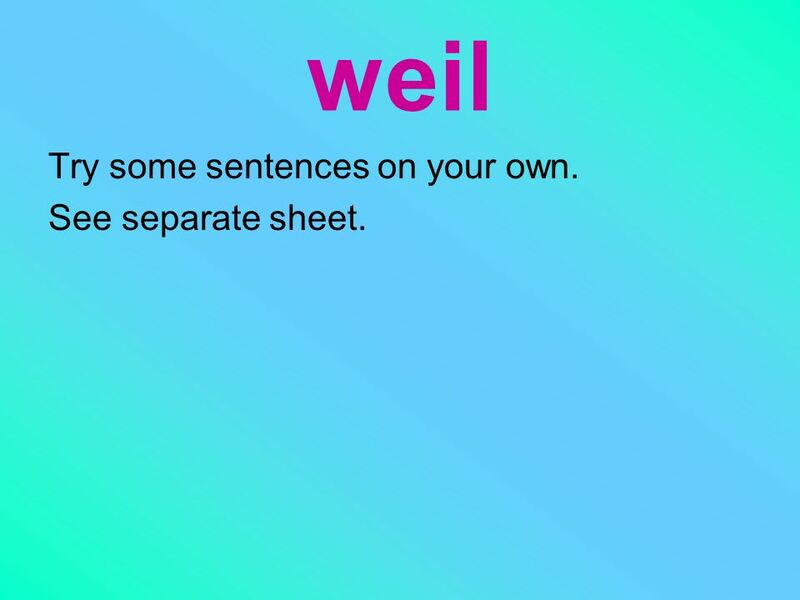 4 weil Try some sentences on your own. See separate sheet. 5 Conjunctions that change the word order. 6 o...z I can’t stand people that phone or text game shows on tv! Hey dudes! 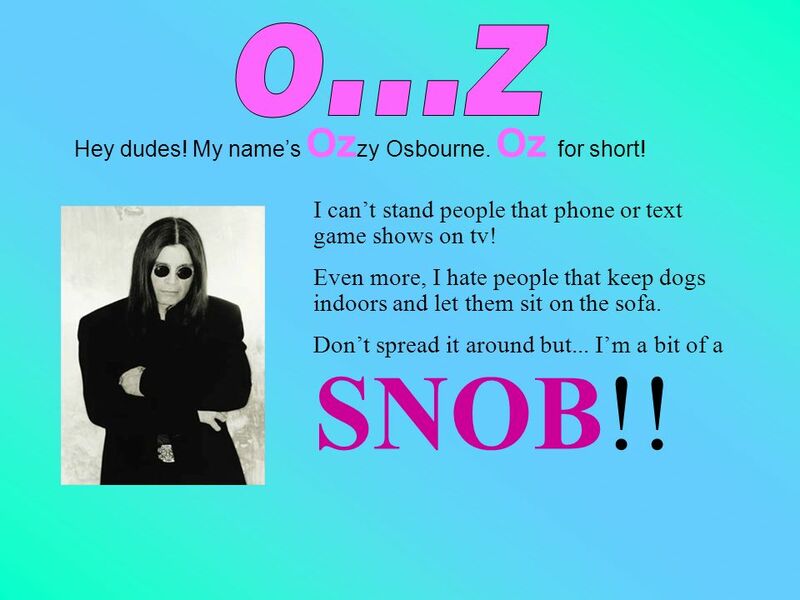 My name’s Ozzy Osbourne. Oz for short! I can’t stand people that phone or text game shows on tv! Even more, I hate people that keep dogs indoors and let them sit on the sofa. Don’t spread it around but... I’m a bit of a SNOB!! 7 This conjunction kicks the verb to the end. 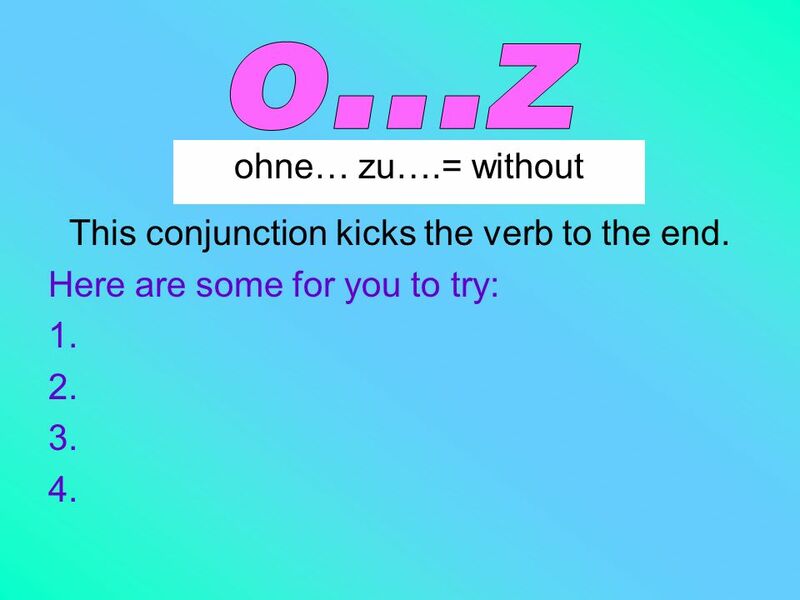 o...z ohne… zu….= without This conjunction kicks the verb to the end. Here are some for you to try: 1. 2. 3. 4. 8 u...z Hey dudes! 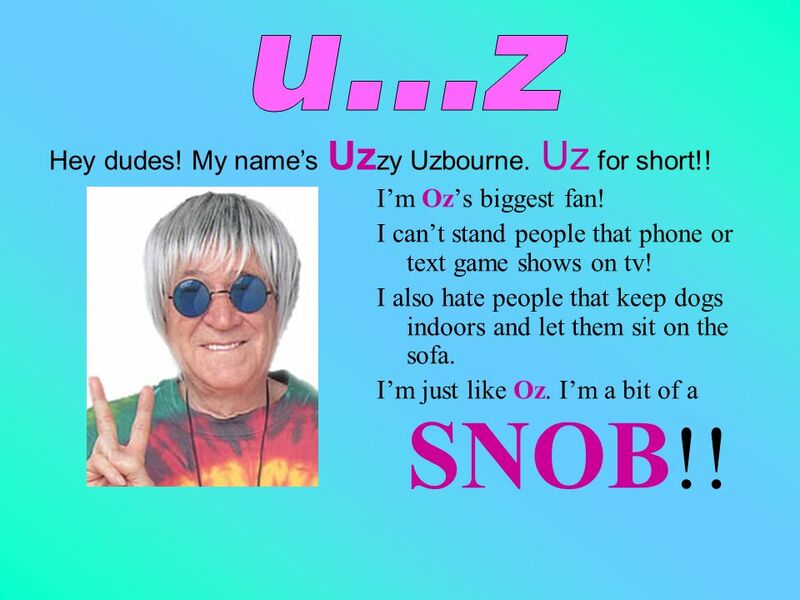 My name’s Uzzy Uzbourne. Uz for short!! I’m Oz’s biggest fan! I can’t stand people that phone or text game shows on tv! I also hate people that keep dogs indoors and let them sit on the sofa. I’m just like Oz. 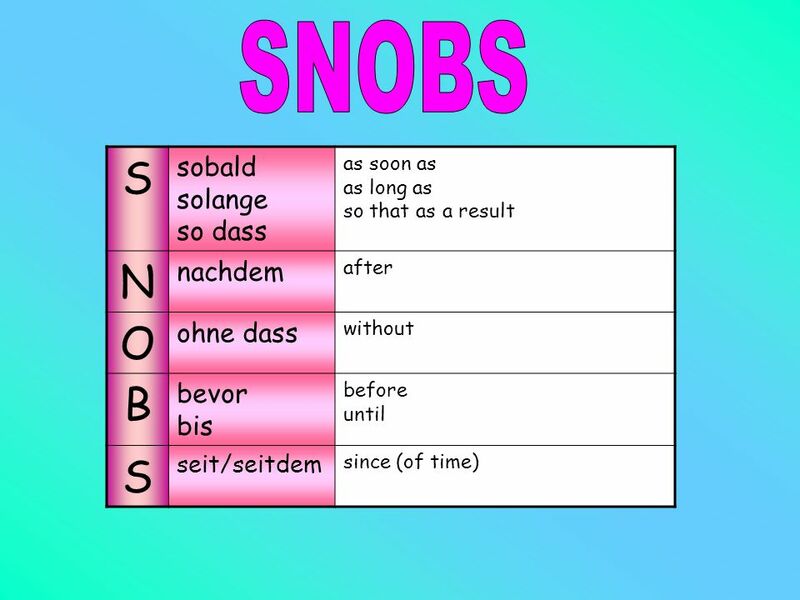 I’m a bit of a SNOB!! Ich spiele Fussball, um fit zu bleiben. VERB comma Where does the verb go?? Ich esse Obst, um gesund zu sein. 10 This conjunction kicks the verb to the end. 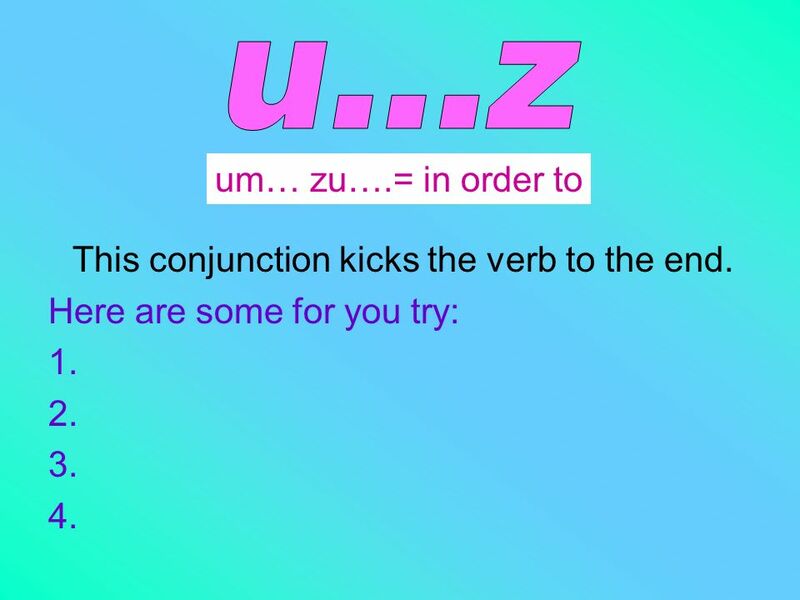 u...z um… zu….= in order to This conjunction kicks the verb to the end. Here are some for you try: 1. 2. 3. 4. 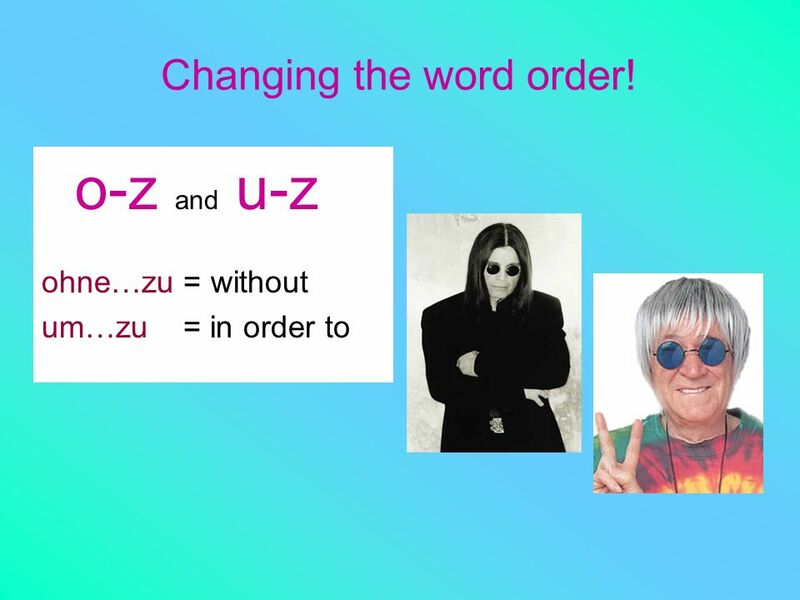 11 Changing the word order! 12 Do you remember the story of the young boy who found out about WEIL’s friends? 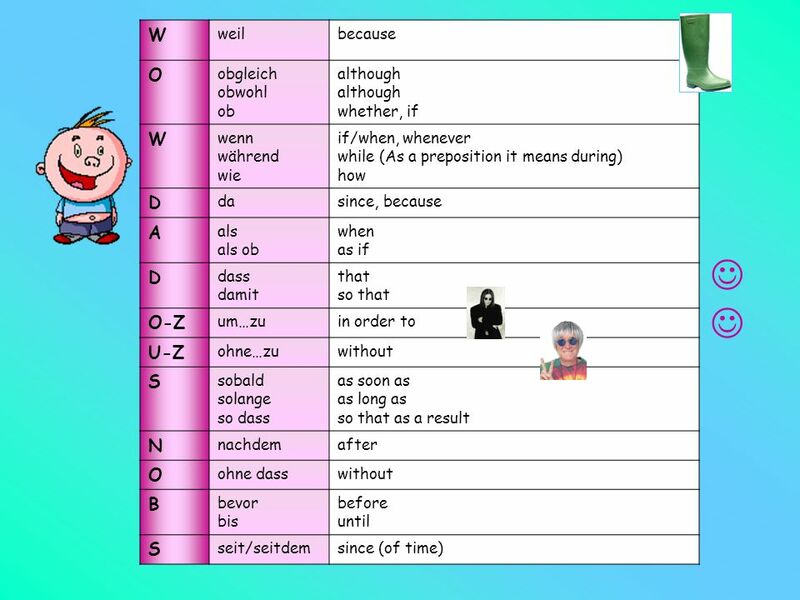 Download ppt "Conjunctions that change the word order." Präpositionen!!!!. 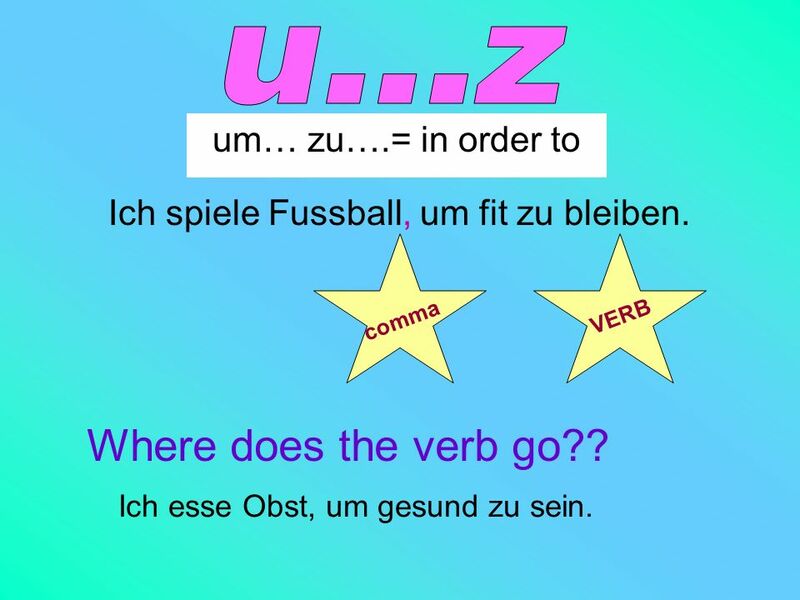 bis until durch through für for. GCSE Listening? So what? Here are 10 top tips that will help you pass the exam with no worries. CRISIS CRISIS fighting for hope for homeless people KS 2 Lesson Plan 2 Recognising and Dealing with Conflict in the Home A Teaching Resource for Primary. ELLD University of Montenegro petarbozovic.wordpress.com. Independent Clauses Independent Clause Expresses a complete thought. It can stand alone as a sentence.. Independent Clauses. COMPLEX SENTENCES have both an independent clause and a dependent clause. Combining Sentences One plus one equals one.. Combining Sentences Sentence combining is making one smoother, more detailed sentence out of two or more.